Can a boy-hungry Jersey girl survive the wilds of Canada with her eco-identity intact? A witty new YA novel from the author of SOPHOMORE SWITCH. Jenna may hail from the �burbs of New Jersey, but Green Teen activism is her life. So when her mom suggests they spend the summer at Grandma�s Florida condo, Jenna pleads instead to visit her hippie godmother, Susie, up in rural Canada. Jenna is psyched at the chance to commune with this nature she�s heard about � and the cute, plaidwearing boys she�s certain must roam there. But after a few run-ins with local wildlife (from a larger-than-life moose to Susie�s sullen Goth stepdaughter to a hot but hostile boy named Reeve), Jenna gets the idea that her long-held ideals, like vegetarianism and conservation, don�t play so well with this population of real outdoorsmen. A dusty survival guide offers Jenna amusing tips on navigating the wilderness � but can she learn to navigate the turns of her heart? From the Hardcover edition. 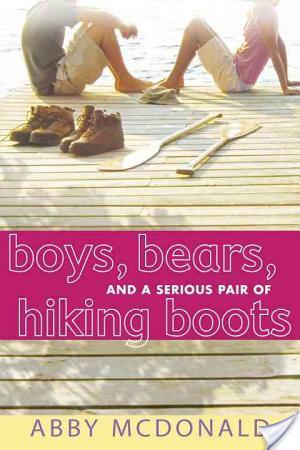 Boys, Bears, And A Serious Pair Of Hiking Boots by Abby McDonald is pretty much exactly what it appears to be, a cute book about a girl who goes into the wilderness. To be honest, I thought this book did an excellent job of serving it’s purpose. It kept me entertained, I awwwwed in the right places, and definitely enjoyed the romance as well as the twists. Jenna, our intrepid main character, hails from New Jersey. She is leader of this group of students called the Green Teens which basically means they are Earth-crunchy. I loved that she was an activist. Let’s please have more of this, as yes, teens do have opinions! Anyways, Jenna’s family decides to go on vacation for the whole summer to Florida at her Grandmother’s place. Jenna is all, oh hell no, and goes to her godmother Susie’s place in Stillwater, Canada instead. Her adventures in Stillwater are what really make the book. Here, Jenna is living in pristine nature conditions, and interacts with people who have a somewhat different outlook on life from her. I like that we get to see Jenna’s coming of age in Boys, Bears And A Serious Pair Of Hiking Boots by Abby McDonald. We get to see her decisions on ideals and values in relation to reality. She’s definitely got a heart of gold, and well it’s nice to see one teen who isn’t all in your face, I do drugs and rebel. In essence, we really see Jenna mature. Granted, this is in the space of one summer, but I do think certain events and experiences are life-changing. Jenna totally holds her own on the adventures she takes, and to me was a strong character in that she takes no b.s., she was caring, kind, held fast to her ideals, and was pretty much straight-forward with everyone. The teenage characters of Boys, Bears, And A Serious Pair of Hiking Boots by Abby McDonald are definitely more flushed out than the adult characters. There’s Fiona, who is Susie’s stepdaughter and going through that bratty rebellious phase. There’s Ethan, who holds a secret. Reeve who is hot, but gruff. There’s Livvy, who is Jenna’s best friend from home — who is basically present via text messages and phone calls. I definitely appreciated the dynamic cast. I was definitely engrossed by this book and would recommend it if you want something lighter between heavy reads. This book is really good so far. Jenna is funny 😀 glad u enjoy it! This books sounds like a good read. It's nice to hear about books in which teens are activists or are doing something proactive. I will definitely have to find a copy of this book. Sounds really fun. Thanks for the rec. You've sold me another one. This sounds like a high-quality, not all fluff chick lit to enjoy with some nice, sunny weather! Can't wait to read this one. I love the title. top review. i like the way you write. this is my first visit to your blog and i will be back. i live over at a blog about books and coffee. but i like wine equally.